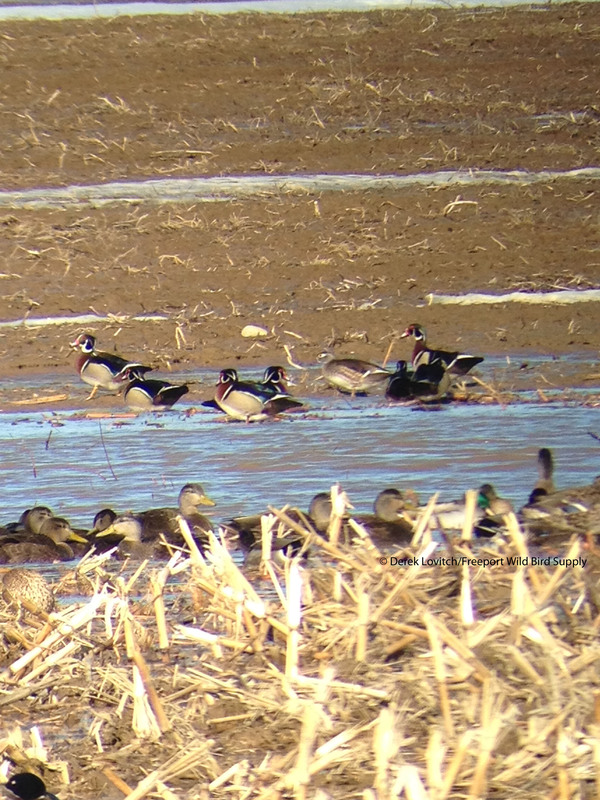 Northern Pintail x Mallard Hybrid in York (Wood Ducks, too)! While birding The Nubble on Tuesday (not seeing Dovekies or Thick-billed Murres), Jeannette and I chatted with a local birder who turned us onto a Dickcissel that was in the House Sparrow flock at the entrance to Sohier Park. Chatting a little longer, we learned of some overwintering Wood Ducks in York. Now, the occasional overwintering Woodie in Maine is not a shock, especially when a mild winter finally turns cold. In fact, I have seen a few this winter, including a bird that was at South Portland’s Mill Creek Cove for almost a month. But the location he mentioned was new to me, and I like learning about new places. So we found our way over to tiny Abbott’s Pond, where, well, a few ducks overwinter. During our visit, we chatted with the landowner, who had come to feed the flock. He said it started with a few geese and other ducks that “people dropped off,” and then it was discovered by wild ducks. Mallards love little places like this, and in winter, the numbers swell, as if often the case where handouts are offered. And A LOT of food is offered here, fed daily from a silo holding three tons of waterfowl feed! A bubbler and the heat from so many birds keeps some water open, which keeps numbers up during the middle of winter (or, as in now, when winter finally arrives). And what’s so fun, from a birding perspective, about places like this where multitudes of Mallards congregate (such as Riverbank Park in Westbrook or Mill Creek Park in South Portland), there are bound to be a few unusual species now and again. This winter, a pair of Wood Ducks was recently joined by a second drake. Comfortable among the habituated inhabitants, the photography opportunities are unparalleled. But even more exciting, we spotted this stunning drake Northern Pintail x Mallard hybrid that has been present here, on and off, for a month or so. This rare (especially in the East) combination is not something I had seen before, so we were excited to photograph and study it! But even if it’s just a bunch of Mallards – the gorgeous drake would be more people’s favorite duck if it wasn’t so common – to enjoy, I know I will be back (in fact, I’ll probably be adding this unassuming little spot to the itinerary of Sunday’s Birds on Tap – Roadtrip! “Seaducks and Suds!” which does, by the way, have a few spaces left). So a casual conversation led to finding one of my new favorite southern Maine birding hotspots. Who knows what has shown up here before, but I know I’ll find out what shows up next! This entry was posted in Birding in Maine and tagged "Birds, Abbott's Pond, Birding, Dickcissel, ducks, Mallard, Northern Pintail x Mallard hybrid, The Nubble, waterfowl, Wood Duck, York on February 15, 2017 by Derek. Common Teal to Northern Lapwing; American Woodcocks to Wood Ducks: 5 Great Days of Spring Birding! Well, that was a helluva good five days of birding! And, I covered a heckuva lot of ground in the process. Yes, spring – and spring birding – is finally upon us. After checking local hotspots on Thursday morning (lots of Killdeer and my first Eastern Phoebes), I began my trek eastwards after lunch. I was giving a presentation and book signing at the Maine Coastal Islands NWR headquarters in Rockland, thanks to an invite from the Friends of Maine Seabird Islands. On the way, I hit a handful of water overlooks, with the only birds of note being my FOY Fish Crows in downtown Brunswick and FOY Double-crested Cormorant in Damariscotta Harbor. But then I arrived at Weskeag Marsh, and that was most productive. Highlighted by two drake “Eurasian” Green-winged (aka “Common”) Teal, a nice diversity of waterfowl also included two pairs of American Wigeon and a pair of Northern Pintail. I flushed two American Woodcocks and four Fox Sparrows from the short trail that leads to the viewing blind. Afterwards, I found a single 2nd-Cycle Glaucous Gull with four 1st-cycle Iceland Gulls still at Owl’s Head Harbor. Here’s a poorly phone-scoped image of one of the Common Teal, showing the bold horiztonal white bar across the wing and the lack of a vertical white bar on the side of the chest. Spending the night with friends, I then met up with staff from the Coastal Mountains Land Trust for a walk around their Beech Hill Preserve to discuss and offer suggestions as to augment and improve bird habitat there. A spiffy male Northern Harrier and a Northern Shrike (my 11th of the season!) were me rewards. I then took the (very) long way home, checking farm fields on my way to the Hatch Hill Landfill in Augusta. Although 900-1000 gulls were present at the dump – a nice number for here – all but 5 were Herring Gulls (plus three Great Black-backed and 2 Ring-billed). At least 10 Bald Eagles were still present however. Working my way down the Kennebec, I checked the mouth of the Abagadasset River in Bowdoinham, which I found to still be frozen. Nearby Brown’s Point, however, had open water, and duck numbers were clearly building, including 44 Ring-necked Ducls and 50+ Green-winged Teal. Back at the store soon thereafter, I found our Song Sparrow numbers had grown from four to 12 overnight. As the rain and drizzle ended on Saturday morning, the birdwalk group convened, and we headed inland (for the first time since December!) to work the “Greater Yarmouth Goose Fields.” Highlighted by two Cackling Geese that were first located on Thursday (a couple of hours after I checked the fields in the fog, dammit!) and yet another Northern Shrike (our third week in a row with a shrike on the birdwalk! ), this very productive outing is fully covered on our website, here – as are all of our birdwalk outings. One of the two Cackling Geese, phone-scoped through the fog. Normally, the birdwalk’s return to the store is the end of my birding on Saturday, but not this week. 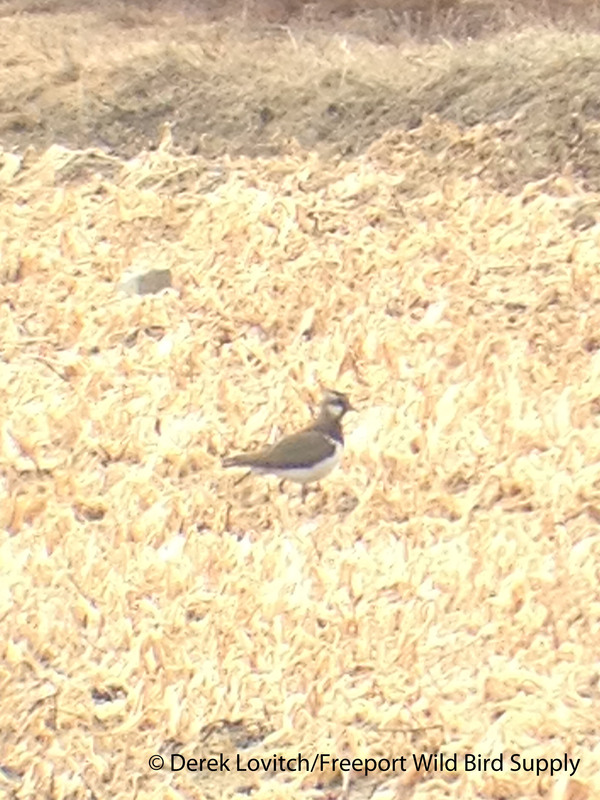 Soon, Kristen Lindquist, Barb Brenneman, and I raced off to Jordan Farm in Cape Elizabeth to twitch a real “mega,” the stunning Northern Lapwing! Discovered Friday evening, the bird was enjoyed by many throughout the day on Saturday, but it was not seen again on Sunday despite much searching. 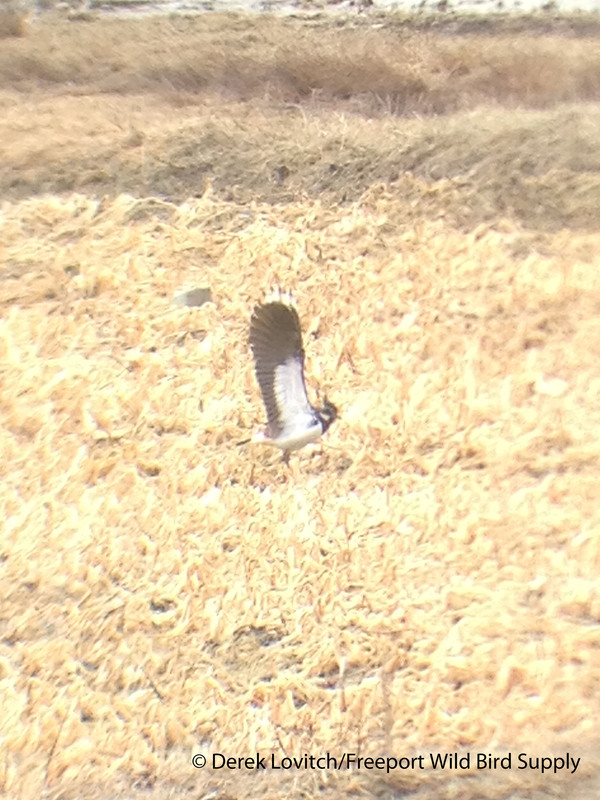 This is the 4th record of lapwing in Maine, and the third in just three years! I consider myself exceedingly fortunate to have seen the last two. 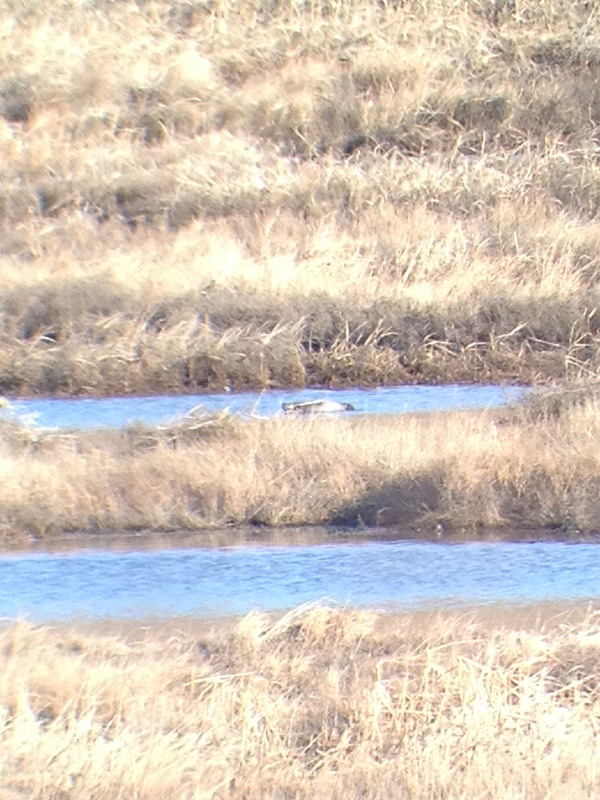 My distantly-phone-scoped photos of the Cape Elizabeth bird hardly do this stunner justice. Yet even still my birding day was far from over, as Saturday night was our annual “Woodcocks Gone Wild at Pineland Farms” dusk trip. Keeping an eye on the weather (the rain had cleared, but increasing winds were a concern), Jeannette and I wondered if we should postpone the outing. Moments after we decided to give the go-ahead in the afternoon, the winds began to gust – a lot. Then, at about 5pm, they died. When our walk got underway at 6:30, there was a little breeze once again, but it was not enough to keep the woodcocks from going wild! In fact, it’s possible that a little wind kept the birds’ display a little lower – especially the first handful of flights – which resulted in quite possibly the best show we’ve ever had here! At least 7 males were displaying, including one repeatedly right over our heads – and at least two more silent birds were observed flying by. Add to this lots of American Robins and a Northern Shrike before the sun set, and the group was treated to a wonderful spring evening performance! Next up was Androscoggin County on Sunday with my friend Phil McCormack. While our primary target was a pancake breakfast at Jillison’s Farm in Sabattus, we were also hoping for a Redhead that was discovered on the outlet stream at Sabattus Pond a few days ago. Well, the pancake chase (the more important one!) was successful, but the Redhead chase was not. However, a very good day of birding was enjoyed nonetheless. Scattered ducks on the river including Ring-necked Ducks and Common Mergansers, a couple of pockets of Tree Swallows, and other assorted species were trumped by two flooded fields along Rte 136 in Durham. With ponds and marshes still frozen, ducks are stacking up at more ephemeral – but unfrozen – habitats. Thousands of ducks and geese were present, mostly Canada Geese, Mallards, and American Black Ducks. However, between the two fields, we tallied an unbelievable 273 Wood Ducks (probably about quadruple my previous high count in the state). Two immature Snow Geese were my first of the year, and very rare away from the coastal marshes in the spring. 18 Green-winged Teal, 12 Ring-necked Ducks, 10 Northern Pintail, and two pairs of American Wigeon were also among the masses. Although these phone-scoped photos hardly do the scene justice, they should at least give you a taste of what things looked like. After brunch, we birded the west side of the Androscoggin River (more Ring-necked Ducks and Common Mergansers, etc) before spending our last hour of our birding (half) day at Bradbury Mountain. Our disappointment over missing an unprecedented 9 Sandhill Cranes was alleviated when #10 was spotted, along with my first two Ospreys of the year. After four days of extensive birding, my Monday agenda at the store was lengthy, but the weather in the morning was just too good to pass up! A spin of the local waterfowl hotspots was fruitful. The Goose Fields yielded the two continuing Cackling Geese along Greely Road, along with my first American Kestrels of the year, and my FOY Wilson’s Snipe, also along Greely. No luck finding a lingering Barrow’s Goldeneye in the Harraseeket River, but at Wharton Point, a group of 7 Northern Shovelers was one of the largest flocks of this species I have seen in Maine. My first Greater Yellowlegs of the year was also present, as were 60+ Green-winged Teal, 16 Ring-necked Ducks, about 30 distant scaup, 8 American Wigeons, and 1 Northern Pintail among several hundred American Black Ducks. Two joyous hours at the Brad were full of raptors: 127 birds had past the watch when I departed at noon, including 4 Osprey. Red-tailed and Red-shouldered Hawks continue to add to their all-time record tallies. Hundreds of Canada Geese were sorted through, hoping for a rarity, while other migrants included Tree Swallows, American Black Ducks, Common Mergansers, and Great Blue Herons. Furthermore, signs of a good flight last night included the return of Golden-crowned Kinglets to the area – after we were virtually devoid of them this winter, and an increase in Red-breasted Nuthatches (relatively few and far between this winter as well), Song-Sparrows, and at the store, a Fox Sparrow – a bird we don’t get here every spring due to our open habitat. So long story short, it’s been a great few days of birding! But now, I should probably get some work done! This entry was posted in Birding in Maine and tagged American Woodcock, Beech Hill Preserve, Birding, Bradbury Mountain Spring Hawkwatch, Cackling Goose, Cape Elizabeth, Coastal Mountains Land Trust, Common Teal, ducks, Durham, Friends of Maine Seabird Islands, Goose Fields, How to Be a Better Birder, Maine, migration, Northern Lapwing, Northern Shoveler, Northern Shrike, Osprey, Pineland Farms, rarities, Sandhill Crane, Snow Goose, Thornhurst Farm, waterfowl, Weskeag Marsh, Wharton Point, Wood Duck on April 7, 2014 by Derek.